On this day 10 YEARS AGO, we met True Jackson, VP! Would you like to see a True Jackson, VP? Let me know in the comments! In the year after Nickelodeon wrapped up “Drake & Josh,” “Unfabulous” and “Zoey 101,” it knew it needed to give fans something great to fill that massive TV void. Thus, “True Jackson, VP” premiered. The show first aired 10 years ago, on Nov. 8, 2008 and lasted for three seasons, even earning itself a proper series finale. It had such a great run, star Keke Palmer (True Jackson) told International Business Times, because “it didn’t make kids feel like they were being talked at” and instead was relatable. The series followed 15-year-old True as she was plucked from her food service job and offered the chance to be a VP at the fashion company, Mad Style. She got through it with the help of her friends — Lulu (Ashley Argota) and Ryan (Matt Shively) — although sometimes they made things worse. She also grew tougher because of having co-worker Amanda (Danielle Bisutti) as an adversary and learned a lot having Max Madigan (Greg Proops) as her boss. Of course, True fell in love along the way, with the office mail guy, Jimmy Madigan (Robbie Amell) [the series also starred Dan Kopelman, who portrayed Kopelman, a Mad Style employee that hardly speaks and is frequently ridiculed by Max]. Palmer, whose new movie “Pimp” releases on Friday, spoke with IBT in celebration of the 10th anniversary. The actress opened up about how she was cast on “True Jackson, VP,” what she took from set and if she’d want to do a revival. International Business Times: Did you know the “True Jackson” 10th anniversary was coming up? 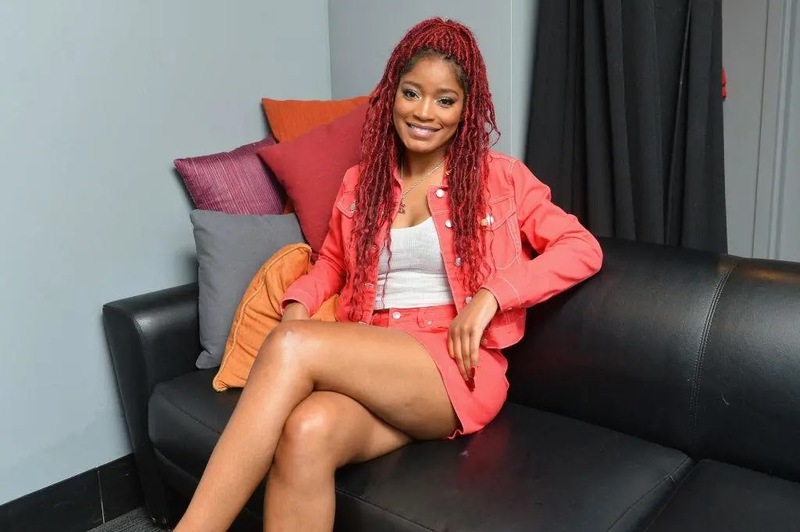 Keke Palmer: Not really…I think you just kind of get in the habit of moving forward. And then when you have a moment when you can look back, it’s like, “Aw, I miss those people. I miss those times. That was a moment. That was a crazy time in my life.” And you’re reminded that way. IBT: What was the audition process like for landing the role of True Jackson? Palmer: I had meetings with Nickelodeon when I first moved to California. Nickelodeon and Disney Channel, before I started doing movies like “Akeelah and the Bee” and such. So, when we had heard about this show...my mom was like, “Hey, how can you get involved with this?” So, we got the script, and then we met with the creator and then after we met with the creator, I pretty much got the part. It was crazy like that. IBT: Did you, Ashley Argota and Matt Shively have easy chemistry to start or did it take a while? Palmer: Yeah, we kind of had the chemistry right away, but, of course, during the course of us working together, we became even more in tune and even more able to play off each other and kind of get where the other’s gonna go with something. But our bond just increased over time. Ashley and I, we had most of our stuff together, and we became very, very close by the end of the show. And Matt, we all were very close. He was a little bit older, though. Ashley and I were both girls and about the same age, and he was kinda getting ready to be an adult and leave his family house…So, we were at two different cross-points, but I think that was also a big part of our relationship, as well, because we could learn from each other. IBT: What was your favorite episode or scene? Palmer: Off the top of my head, I would say, there’s this one funny clip I always see around and I think it’s really funny. [It’s] where True pushes the bully into the fountain…I just thought that was so funny. IBT: Did you take anything from the set when the show ended? Palmer: Oh yeah, I took a bunch of little stuff. Like clothes and props. All this stuff. IBT: Did you have a favorite True Jackson outfit? Palmer: Yes. She had this, I can’t remember what episode it was on, but it was a really cute navy blue dress that had like little horses or something on it. I loved it. IBT: Would you ever want to go back to that role and do a revival movie or show, or do you like to keep your past roles in the past? Palmer: Not always, it depends. It depends, pretty much. I think sometimes you do stuff for your art and because of what it meant to you. Meaning, sometimes you go back to things because of what it meant to people or what it meant to do that show. I was growing up just like True. [I was] about the same age as the character or younger when we first started filming. True was 15 and I was 14. For the kids that were watching the show, I could see myself doing something for them, but it would definitely have to be more mature. ‘Cause I do think that’s an important thing to give to your audience, too. If you do something that you did before, in a current way, you really gotta make it current…I would want it to be more [mature] because she’s 25 now. Follow Palmer on Twitter for the most up-to-date info on her new projects. It’s been 10 years since True Jackson premiered..... YOU SAY WHAT NOW!? How has it been 10 years. Time. Do me a favor a slow your roll. K thx bye. Check out Nickelodeon's On This Day and Remember When Facebook pages to find out awesome Nick moments from every era throughout Nickelodeon history! More Nick: Nickelodeon and Paramount to Bring Rugrats Back for the Next Generation of Kids with an All-New TV Series and Feature Film! Additional sources: Just Jared Jr., Wikipedia. Follow NickALive! on Twitter, Tumblr, Google+, via RSS, on Instagram, and/or Facebook for the latest Nickelodeon and True Jackson, VP News and Highlights!